Two moon won’t seen on 27 august 2013 !! Yes … it’s happening again. An email is circulating – and social media is buzzing – with the suggestion that – on August 27, 2013 – Mars will appear as large as a full moon in Earth’s sky. SEE MARS AS LARGE AS THE FULL MOON ON 27TH AUGUST 2013. Should be spectacular! Truly a once in a lifetime experience! One version I saw included a powerpoint presentation, suggesting that Mars and Earth’s moon will appear as a “double moon” in late August. I’ve also seen the photo below, circulating on Facebook. 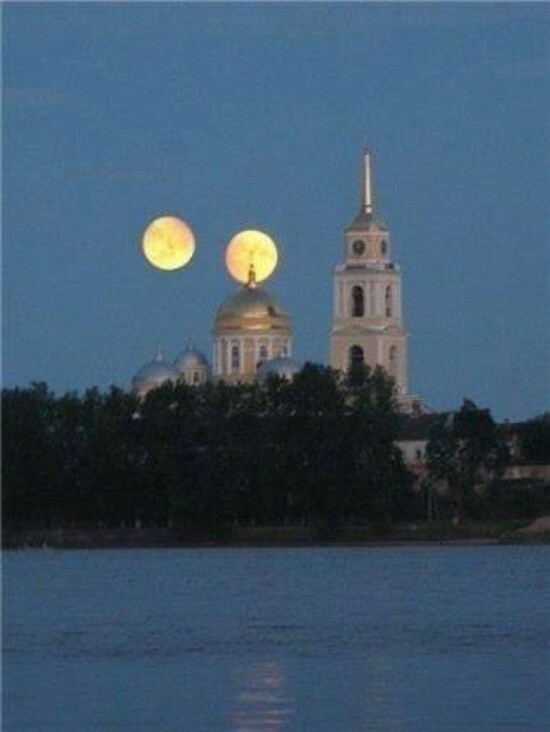 This image is circulating on Facebook, with the claim that Mars will appear as big and bright as a full moon on August 27, 2013. It’s a hoax. Don’t believe it. Mars never appears as large as a full moon in Earth’s sky. It sounds amazing! Can it possibly be true? No. It can’t. The email and photo are perpetuating a hoax that rears its crazy head every summer. The hoax has circulated every summer since 2003. Mars can never appear as large as a full moon as seen from Earth, and Mars will not even be at its brightest in August of 2013. In fact, right now, Mars is relatively faint and inconspicuous in the predawn sky, shortly before the sun comes up. In August of 2013, Mars appears in the eastern sky during the wee hours before dawn. It’s not far from another planet, a brighter planet, Jupiter. Jupiter is the second-brightest planet; Venus is the brightest planet Mars sometimes achieves a brightness close to that of Jupiter, but, even so, Mars always looks like a star, with nowhere the size or brilliance of the full moon. The red planet Mars, as seen by the Hubble Space Telescope. Can you imagine seeing this in our night sky? It’d be terrifying! But it can’t happen. Image via NASA. As seen from Earth, in months when Mars does appear side by side with a full moon (and, again, that’s not happening in August 0f 2013, or in any month this year), Mars’ diameter is about 1/140th the diameter of the full moon. You would have had to line up 140 planet Mars – side by side – to equal the moon’s diameter. Ah, Mars. World of dreams and visions. Mars is the world orbiting one step outward from Earth’s orbit. This world is slightly smaller than Earth – but slightly larger than Earth’s moon. Mars is also much much farther away than Earth’s moon. It’s hard to comprehend what little specks the planets and moons are in contrast to the vastness of space, but let me put it this way. Earth’s moon is about a light-second away. Traveling at 186,000 miles per second, light bouncing from the moon’s surface takes about a second to reach us here on Earth. Meanwhile, light from Mars takes much much longer to reach Earth – from several minutes to about 20 minutes – with the difference being the result of Earth’s and Mars’ motions around the sun. In other words, when Mars is on the same side of the sun as Earth, its distance from us is less than when it’s on the far side of the sun from us. The moon is much closer than Mars, and that’s why we see the moon as a bright disk in our sky. Meanwhile – to the eye – Mars never appears as anything but a star like point. So how did this rumor of Mars-as-big-and-bright-as-the-moon get started? It started with an actual event, in 2003. On August 27 of that year, Earth and Mars came very slightly closer than they’d been in nearly 60,000 years. Our two worlds, center-to-center, were less than 35 million miles apart – just over three light-minutes apart. The last people to come so close to Mars were Neanderthals. Astronomy writers like me had a field day that year, talking about Mars at its closest. Was it a spectacular sight? Yes! It looked like a dot of flame in the night sky. Was Mars as big and bright as the moon, even at its closest in 2003? Never. 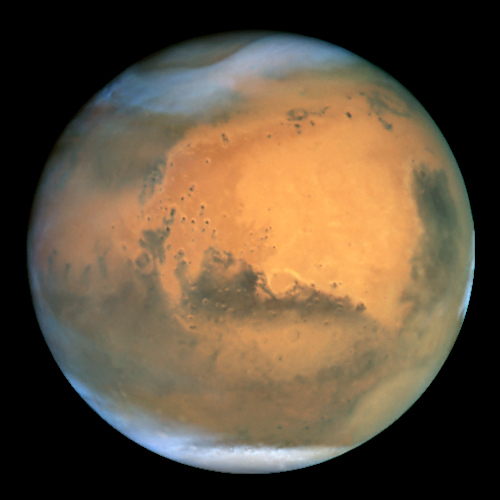 Bottom line: Mars will not appear as large as the full moon on August 27, 2013. Mars will not ever appear as large as a full moon in Earth’s sky. The email – or social media – claims to the contrary are a hoax.